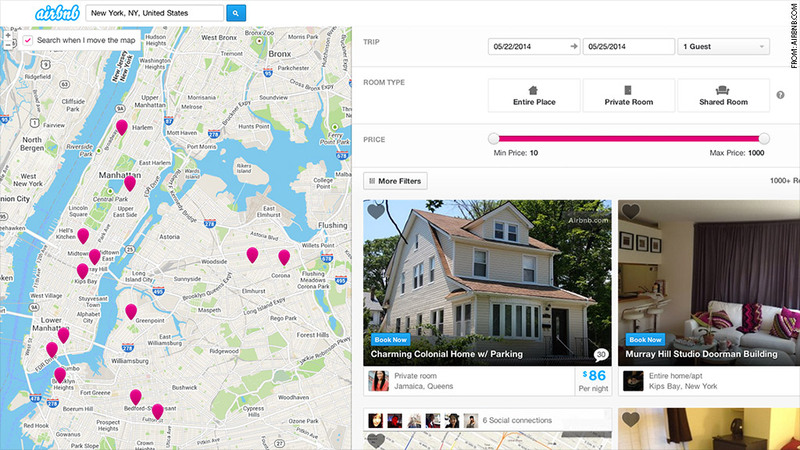 Airbnb listings for New York City. Airbnb is finally opening up to the New York attorney general's office, after a six-month long legal battle. The housing-rental site announced Wednesday that it had reached an agreement to turn over data on users that New York Attorney General Eric Schneiderman says may be violating state housing laws. The two sides said in a joint statement that their accord balances "Schneiderman's commitment to protecting New York's residents and tourists from illegal hotels with Airbnb's concerns about the privacy of thousands of other hosts." Airbnb offers an online platform for people to rent out their homes or apartments to travelers. The issue it's facing in New York is a law stating that residents can't rent out properties for fewer than 30 days when they aren't living there. Airbnb has argued that the law is meant to crack down on landlords who buy residential buildings and run them as hotels, not on individual tenants. The company had been fighting the attorney general's request that it give up data on its hosts, calling the subpoena a "vast data demand on regular New Yorkers." Schneiderman has countered that as many as two thirds of Airbnb rentals in New York City may be illegal. Under the agreement announced Wednesday, Airbnb will provide Schneiderman with anonymized user information, redacting personal details, including names, email addresses, tax information and Social Security numbers. Airbnb must later surrender some of those details if New York officials choose to single out individual users for investigation. Airbnb public policy head David Hantman said in a blog post Wednesday that the company believes Schneiderman's effort "is focused on large corporate property managers and hosts who take apartments off the market and disrupt communities." "We have already removed more than 2,000 listings in New York and believe that many of the hosts the Attorney General is concerned about are no longer a part of Airbnb," Hantman said. Going forward, he added, Airbnb wants New York to amend its housing laws "to allow anyone in New York who wants to rent out their own home to do so." This isn't the first legal headache Airbnb has faced as it works to bring its unconventional home-rentals model to cities across the world. In San Francisco, a law is pending that would allow residents to rent out their primary homes only after applying for the right to do so and agreeing to legal guidelines. But despite these challenges, the service is growing rapidly and is now available in more than 34,000 cities in 192 countries. The company has reportedly been engaged in fundraising this year that would value it at $10 billion, more than all but three of America's largest hotel chains.